MOL Ferry - View timetables, Compare and book ferry tickets at directferries.ie. 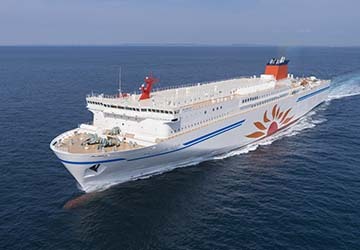 MOL Ferry offer a domestic ferry service in Japan linking the main island of Honshu to the northern island of Hokkaido connecting the ports of Tomakomai and Oarai up to twelve times weekly. The MOL ferry service is operated by the Sunflower ferry which provides a luxurious on board experience with elegant cabins and hotel like amenities. 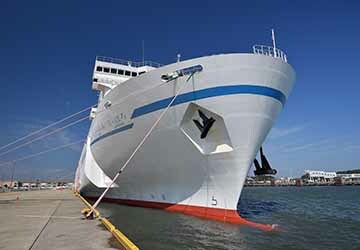 On board cabin accommodation classes range from standard economy style to deluxe suites. Cabins are available in a choice of western style rooms (fitted out like a hotel room) or Japanese style which feature traditional tatami flooring. If you’d prefer not to book a cabin, then you have the option to book a bed in a large and comfortable carpeted room with basic amenities. On the evening crossing, all restaurant meals are buffet style and feature traditional Japanese dishes as well as Chinese and Western offerings. You can also purchase a range of souvenirs, daily necessities and more in the on board shop. Direct Ferries provides a ferry timetable and price comparison, based on your search criteria, allowing you to compare MOL Ferry products with multiple ferry company timetables and fares in one search. Compare MOL Ferry timetables and prices now with all alternative ferry operators before booking your ferry ticket to ensure you get the best option for your ferry trip.